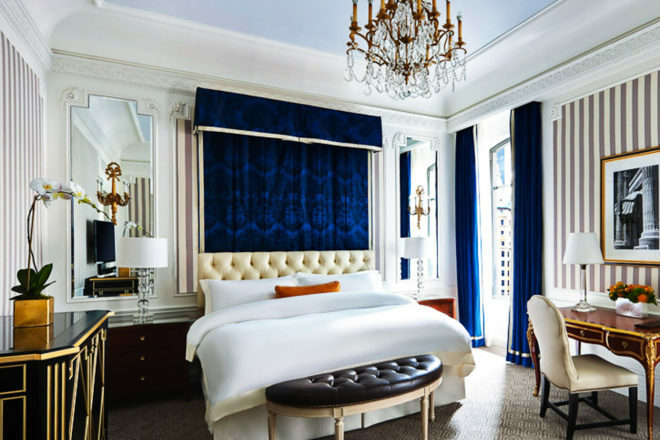 It doesn’t get any more flagship than St Regis New York, now with an equally impressive fresh look. This New York icon – home to the Bloody Mary (originally called the Red Snapper) and former seasonal residence of the late Salvador Dali – has just revealed a major refurbishment. Original design elements of the 1904 Beaux Art building will be restored and maintained, like the oval windows above the front desk and Waterford crystal chandeliers, and blended with contemporary glamour. The legendary King Cole Bar has been expanded and renamed King Cole Bar & Salon with food by ‘chef to the celebs’ John DeLucie. The guestrooms also had a zhush with new marble entrances, rich colours and fabrics, and state-of-the-art technology. But design junkies will be happy to hear the bespoke décor in the Tiffany, Bentley and Dior suites was maintained.